By Postbus you can drive from Brig to Ried-Brig or by car to the toll-free parking lot of Rosswald valley station. The cable car takes you to Rosswald (1820 m above sea level). Rosswald is a small, car-free resort with sun-tanned chalets and stunning views to the Lower Valais. At the mountain station, the path climbs up to the parking lot. Then you hike on the natural road in the direction of Stafel (1997 m.ü.M). The hiking trail leads to the right of the tree line and turns in an easterly direction slowly sinking after the Steinutal, an alp occupied with sheep. Via a step-like section you climb up to the Bortelalp (2113 m above sea level) and the Bortelhütte. Over the Schrickboden it then goes up again to Wase. You then descend through the magnificent larch forest to Rothwald, from where you take the post bus back to Brig. The way is also in the opposite direction an impressive experience. Distance: 15 km | Time needed: 6 h | Ascent: 301 m | Descent: 370 m | Highest point: 2120 m.ü.M. From the Hotel Restaurant Ganterwald «Bim Heiri» it's easy to go on the paved forest road, which starts just behind the hotel. This leads up to the Durstbach to the "oberen Egge". 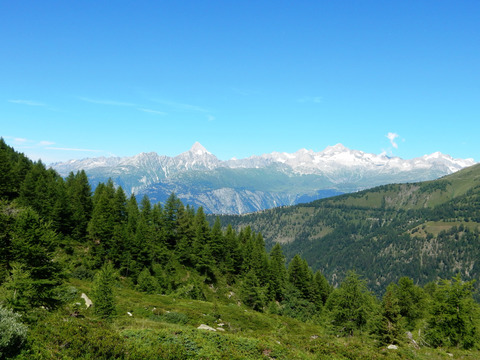 Here, directly at the first chalet, a path leads up through a short wooded area to the beautiful meadows of Wasenalp. Soon you reach the highest point of the hike, the Restaurant Wasenalp. After hunger and thirst are no longer an issue, follow the Wasmerstrasse to the "Martinskehr". From here, a beautiful path leads directly to Rothwald where the restaurant Post and the restaurant Schutzhaus wait for thirsty hikers. From here you can reach the starting point in a few minutes via the sidewalk of the Simplonstrasse - the Restaurant Ganterwald, where you can "Bim Heiri" approve the deserved final drink. By Postbus you reach the Simplonpass (2005 m.ü.M). At the hospice, the path begins and leads in the direction of Chaltwasser (pass at 2770 m above sea level) to the Mäderlicka (2887 m above sea level). The descent is very steep and requires good footwear. Via Hohbiel you reach the bus stop at Rothwald. Distance (length): 10.5 km | Time needed: 5 h | Rise: 884 m | Descent: 1127 m | Highest point: 2887 m.ü.M.